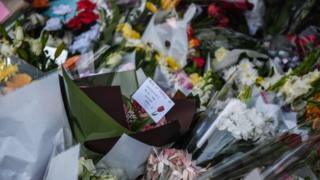 More than 100 people have taken part in a vigil outside an Australian primary school after two boys were killed when a car crashed into their classroom. The crash in Sydney on Tuesday also left three girls in hospital. The driver of the car, Maha al-Shennag, 52, has been charged with dangerous driving occasioning death. Police believe the crash was not intentional. Flowers, toys and cards have been left at the gates of Banksia Road Primary School, which reopened on Wednesday. The eight-year-old boys died in hospital. The three girls – two aged eight and another aged nine – were in a stable condition in hospital on Wednesday. Paramedics assessed another 17 students and their teacher at the scene. Local MP Jihad Dib paid tribute to the “very close-knit school community” after students and parents were among those who attended a vigil on Tuesday night. “Many times schools are touchstone points in communities, and it is really important the doors and gates stay open,” he told the Australian Broadcasting Corp on Wednesday. He said he understood that Ms al-Shennag was also a parent at the school. She was released on bail and will face a court hearing in Sydney on 29 November. Counselling services have been provided to students and staff, local education authorities said.